Behbahan, I. S., McBrian, M. A. and Kurdistani, S. K. (2014). A Protocol for Measurement of Intracellular pH. Bio-protocol 4(2): e1027. DOI: 10.21769/BioProtoc.1027. Intracellular pH (pHi) is an important physiological determinant of enzyme activity and cellular function (Kurkdjian and Guern, 1989). All proteins depend on a tightly regulated pH to maintain their structure and function. Protonation–deprotonation events can dictate the charge of biological surfaces and are integral steps in many metabolic reactions (Casey et al., 2010). Moreover, the proton gradient across the mitochondrial membrane is used to generate cellular energy and support other mitochondrial processes. As a result, cells have developed multiple mechanisms to maintain a narrow range of pHi in response to extra- and intracellular fluctuations in pH (Orij et al., 2012). Here, we describe a protocol for pHi measurement in live cells that uses fluorescent microscopy and the pH sensitive dye 2’,7’-Bis-(2-Carboxyethyl)-5-(and-6-)-Carboxyfluorescein Acetoxymethyl Ester (BCECF-AM). This method was recently used to determine the effects of intracellular pH changes on global histone acetylation levels (McBrian et al., 2013). Grow cells (~105) in 35 mm glass bottom dishes to 40% confluency. Note that in comparison to plastic dishes it takes longer for cells to attach to glass bottom dishes. Treat cells with drug of interest or siRNA for the desired length of time up to when cells reach ~40% confluency. A perfusion system should be installed to reduce background signal due to BCECF leaking out of the cell and to keep media temperature and pH constant throughout pHi measurement. Outflow and inflow tubes should have the same length to prevent overflow or drying of the plate. 2 ml/min is the recommended rate of perfusion; faster rates may have a shearing effect on the cells which affect the pHi. To connect the outflow and inflow tubes to the dish, we used needles that we bent into the shape of hooks and fixed them to the dish with paraffin wax. Premade sets are available commercially: https://www.warneronline.com/product_info.cfm?id=958. For efficient flow and to prevent turbulence, we used perfusion inserts for 35 mm dishes and fixed them in the dish with paraffin wax. We recommend testing the smoothness of the flow by a visible dye such as trypan blue to confirm efficient flow before the start of experiment. Wash perfusion system with distilled water for 4 h prior to the experiment to remove any residue - especially nigericin from a previous experiment – inside tubes. Set up a rack inside a water bath at 37 °C to hold a 50 ml conical tube containing the perfusion solution which is the same as the loading solution. Bubble 5% CO2 at slow to moderate rates (~1 bubble/sec) for at least 20 min into the loading solution prior the experiment to equilibrate pH, similar to the conditions inside an incubator. Continue bubbling 5% CO2 into the loading solution during the experiment to maintain pH. Have a calibrated pH meter handy. The pH of the loading solution can be continuously monitored to ensure consistency. Set up the perfusion system and the settings on the microscope. Install the Chroma filter-set for BCECF and define the channels for the software. Check the filter wheel and make sure the excitation and emission channels are defined correctly in the Axiovision software. Make sure bulb intensity is at 50% and filter density at 10% to prevent phototoxicity to the cells. Open Axiovision and set exposure times to 100 msec for 440 nm and 200 msec for 495 nm. Emission is set at 535 nm. Also specify the program to take 6 pictures at 30 sec interval. Dilute a vial of BCECF in 80 µl DMSO. Use pre-aliquotted BCECF powder to prevent repeated freezing and thawing cycles (the BCECF dye does not work well after 2 freeze-thaw cycles). Remove media from cells and wash cells with 3 ml of loading solution to remove residual media (certain amino acids interfere with dye loading). Pipet 2 ml 1x EBSS onto the plate of cells followed by addition of 10 µl of BCECF directly onto the plate. Mix gently by pipetting the EBSS-BCECF solution up and down. Place cells in the incubator for 25 min. Start flowing loading solution through the perfusion system 5 min before the incubation is done. To prevent photo-bleaching, wrap the cell plate with a piece of aluminum foil as soon as it is removed from the incubator and is being transferred to the microscope room. Turn off the lights in the room (the light from the computer screen should provide ample light). (Work fast in this step) Immediately mount the loaded dish on the microscope stage and fix it in place with paraffin wax to prevent any movement during image acquisition. Install perfusion insert and inflow and outflow tubes. Run the perfusion system and meanwhile focus the microscope to find a suitable area – about 40% confluent – for taking pictures. We recommend using the halogen light at the weakest possible intensity for focusing and then using fluorescent light for fine focusing to reduce the risk of cell toxicity. 10x–40x magnification could be used. With 10x magnification larger number of cells can be evaluated. Let loading solution run through the system for 2-3 min and then take 6 pictures at 30 sec intervals (automated at step 6) (Figure 1). Figure 1. The final set up for intracellular pH measurement is shown. The components of the system are labeled. Import the pictures to Slidebook (make sure you define the channels correctly in Slidebook). After importing the pictures, define the background by selecting an area close to the middle of the picture with some cells nearby. Then select the cells using the Mask tool. In the Ratio tool, define 495 as the numerator and 450 as the denominator. Extract the ratio data of 495/450 channels and import the data to Excel. Remove outliers. Convert the ratio data to pH values using the calibration equation (see below). 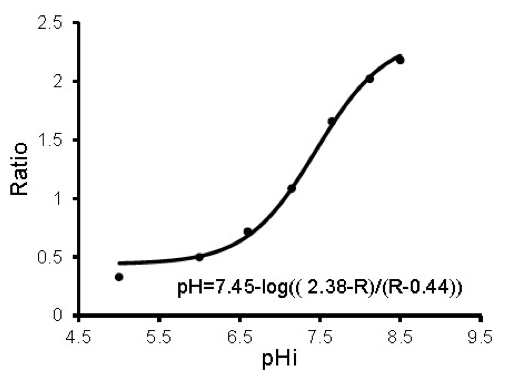 Intracellular pH measurements with BCECF are made by determining the ratio of emission intensity at 535 nm when the dye is excited at ~490 nm (pH-dependent) versus the emission intensity when the dye is excited at its isosbestic point of ~440 nm (non pH-dependent). In situ calibration of BCECF's fluorescence is done the same way but in presence of 10–50 µM nigericin and 100–150 mM K+ to equilibrate internal and external pH. In situ calibration should be done for every experiment. After pictures are taken, aspirate the loading solution carefully from the loaded and fixed plate on the microscope and add 2 ml of calibration solution slowly using the side of the plate. Aspirate the calibration solution and then slowly add 2 ml of calibration solution with nigericin using a pipette. Wait 5 min before taking 2 pictures. Repeat this process at pH values 5.5, 6, 6.5, 7, 7.5, 8 and 8.5. No flow is needed at this point. Import pictures to Slidebook and analyze as described above to obtain the 495/450 ratio for each calibration pH value. To convert the ratios to pH, use SigmaPlot to obtain an equation that best describes the data. The calibration data should fit a sigmoidal plot. Use the equation that describes the sigmoidal plot to convert the experimental ratios obtained above to pH values (Figure 2). The amount of NaHCO3 needed is determined by the desired pH of the loading solution. Adjust the osmolarity of the solution to 290-310 mOsm by adding gluconate or sorbitol. Prepare enough solution to have about 25 ml per plate. Filter the solution and aliquot into 50 ml conical tubes. Place the tubes with their caps slightly open in a 5% CO2 incubator overnight for pH equilibration. Note: Hela cells were cultured in 10 cm dishes using the following cell culture medium. This protocol has been modified from several previous publications as described in the references section, and recently used in McBrian et al. (2013). Casey, J. R., Grinstein, S. and Orlowski, J. (2010). Sensors and regulators of intracellular pH. Nat Rev Mol Cell Biol 11(1): 50-61. Kurkdjian, A. and Guern, J. (1989). Intracellular pH: measurement and importance in cell activity. Annu Rev Plant Biol 40(1): 271-303. McBrian, M. A., Behbahan, I. S., Ferrari, R., Su, T., Huang, T. W., Li, K., Hong, C. S., Christofk, H. R., Vogelauer, M., Seligson D. B. and Kurdistani, S. K. (2013). Histone acetylation regulates intracellular pH. Mol Cell 49(2): 310-321. Orij, R., Urbanus, M. L., Vizeacoumar, F. J., Giaever, G., Boone, C., Nislow, C., Brul, S. and Smits, G. J. (2012). Genome-wide analysis of intracellular pH reveals quantitative control of cell division rate by pH(c) in Saccharomyces cerevisiae. Genome Biol 13(9): R80. How to cite: Behbahan, I. S., McBrian, M. A. and Kurdistani, S. K. (2014). 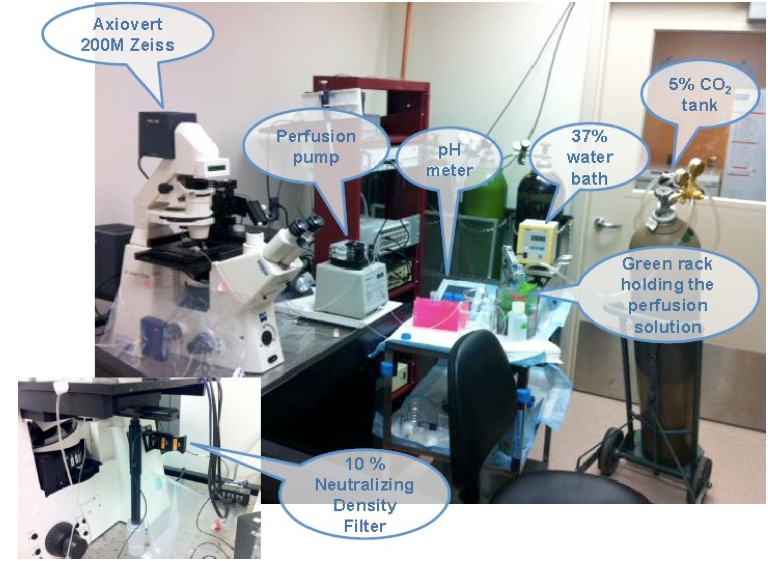 A Protocol for Measurement of Intracellular pH. Bio-protocol 4(2): e1027. DOI: 10.21769/BioProtoc.1027.